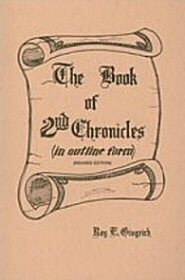 In the Bible of most Christians, the pages of Second Chronicles are unsmudged, unmarked, and unworn. Most Christians have either never read the book through or else they have read it through only once. Why do Christians shun this book? Because they believe that Second Chronicles is only a rehash of First Kings and Second Kings and that it is more difficult to read than are the Kings, so why should they read Second Chronicles? But Christians who do not read this book are passing over a book which is filled with precious truths, a book which (although written about Judah) has much to say to us as a nation and to us as individuals.